Happy Monday friends! I've already been at work for an entire week and it's been a crazy one at that. 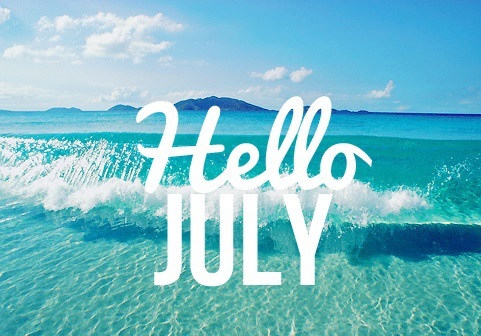 I'm so excited for July to get here because personally, it's one of my favorite months. Why? It's my birthday and anniversary month! Wooo! But hey, let's start with some great goals I want to get accomplished this month because let's face it, summer is already going by way too quickly! 1. Work On Physical Therapy - I'll be explaining more on this in a different post but at my 6 week post baby check up, I was diagnosed with , a condition where my upper ( and lower abs ) separated after having Landon. My lower ones were so bad that my doctor ended up sewing them while I was having my c-section and my upper are about 2 finger width apart. She suggested I start physical therapy to start pushing my abs together again and I had my first appointment last week. I'm hoping to continue with them for the next few months and working on the exercises they are giving me at home as well as at their office. 3. Pool Time - We have great friends that have a community pool which we loved taking Lily to last year. Recently we purchased our own inflatable pool for our backyard and got it out a few days ago. I forgot how fun it is to have it in our backyard and not be worried about my three and a half year old running around ( because girlfriend has so many scrapped knees its ridiculous ) and enjoy time together in the sunshine! 4. Anniversary/Birthday - This year will be a super low key celebrating some big milestones this month. As I mentioned before, it's my 5 year anniversary Thursday and I turn the big 31 at the end of the month. I'm actually happy to be doing small things like dinner at home with my family for these events. Someone grab me that bottle of wine mmmmk! 5. Work Out- Thanks to physical therapy I know what I can and cannot do with certain exercises. I'm super anxious to get back to my local gym and really start getting back into shape, despite loosing a lot of weight with nursing Landon. Any fun pointers you can share with me would be super helpful friends! Blogging and staying active are always my goals! You're right, when life gets hectic blogging is usually the first thing to go on the back burner for me. Good luck!